Even though we could not verify that the long-awaited critical items had arrived in Kabul, we had anticipated the celebratory cake. Armed with several other reasons for a cake . . . a staff birthday and public holidays in the next week, we purchased the cake. Television antenna shaped cakes had no appeal. The final choice was a standard cake with an old advertising slogan from the manufacturer of the cameras that were in the shipment. 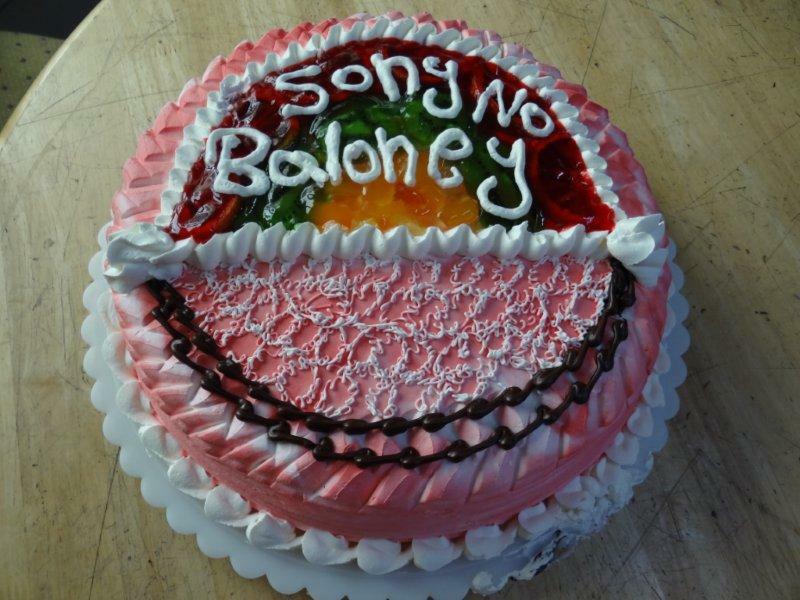 I might be the only one that recalled the “no baloney” phrase from Sony’s Walkman-era ad campaign. The cake was very tasty and we are working on a reason for another cake as soon as possible. This entry was posted in Afghanistan 2012 by Mark Timpany. Bookmark the permalink.